While I can't be sure if it is indeed the only existing field of its kind in the world, it is the largest, according to its host, the Institute of Radiation Breeding. Measuring 100 meters in radius and enclosed by an 8-meter high shielding dike wall, crop species within are irradiated with gamma rays from a cobalt-60 source placed inside a central pole. The purpose here is to generate new traits, such as tolerance to fungus infection or consumer-friendlier fruit colors. 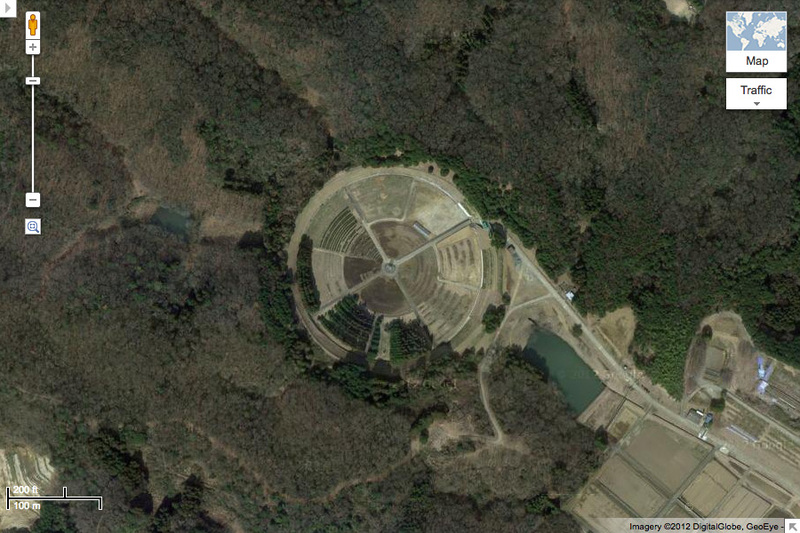 The circular spatial form of the gamma gardens, which in aerial view uncannily resembles the radiation danger symbol, was simply based upon the need to arrange the plants in concentric circles around the radiation source which stood like a totem in the center of the field. It was basically a slug of radioactive material within a pole; when workers needed to enter the field it was lowered below ground into a lead lined chamber. There were a series of fences and alarms to keep people from entering the field when the source was above ground. The amount of radiation received by the plants naturally varied according to how close they were to the pole. So usually a single variety would be arranged as a 'wedge' leading away from the pole, so that the effects of a range of radiation levels could be evaluated. Most of the plants close to the pole simply died. A little further away, they would be so genetically altered that they were riddled with tumors and other growth abnormalities. It was generally the rows where the plants 'looked' normal, but still had genetic alterations, that were of the most interest, that were 'just right' as far as mutation breeding was concerned! Zooming out, meanwhile, one notices a ridiculously high concentration of golf courses. Rather than see that as a testament to the sport's popularity in the country, I prefer to think of it as a terrestrial experiment gone wild. At night, when the scientists have gone home, aberrant landscape architects in their CBRN suits break inside to elevate the cobalt pole, or maybe install their own fantamagical source material, above the containment of the dike wall to irradiate the surrounding countryside in the hopes of inducing landscape mutations, beneficial or otherwise. so what happens to the insects that fly in there? No wonder Japan has a Godzilla problem!